Minimum quantity for "25 Ct. 1" X 1.7" Neon Color Standard Flags (6/Pack)" is 24. Arrow flags direct immediate attention to the important part of your documents by directing reader's eye to specific informaiton. 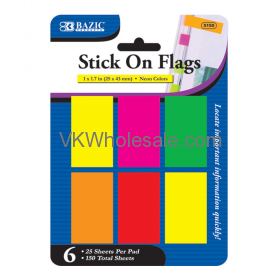 These self stick flags adhere securely and remove cleanly. Allow repositioning withe else. It help you to locate information quickely. 25 sheets per pad. Minimum quantity for ""HELLO my name is" Name Badge Label (25/Pack)" is 24. Minimum quantity for "10, 17, 27 mm Size Lettering Stencil Sets (3/Pack)" is 24. Minimum quantity for "100 Ct. 3" X 3" Yellow Stick On Notes" is 12. Minimum quantity for "12 Color Premium Quality Jumbo Crayon" is 12. 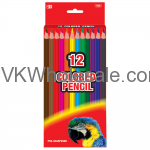 Minimum quantity for "12 Colored Pencils" is 24. Minimum quantity for "20 ct. 0.7 mm. Mechanical Pencil Lead (8/Pack)" is 24.